The Terms and Conditions on this page only apply for private walking tours booked with BuenosTours – for any other activity booked through or recommended by BuenosTours, please refer directly to the relevant activity provider for their terms and conditions. If you need our help in contacting such other activity providers, let us know in an email and we’ll do our best to help. Please read the below Terms and Conditions carefully before going ahead with your private walking tour booking. The purchase of any private walking tours offered by BuenosTours constitutes a contractual agreement between you and BuenosTours, as defined by these Terms and Conditions. These Terms and Conditions are subject to change without notice, from time to time, at our discretion. BuenosTours will endeavor to communicate the most updated Terms and Conditions to our clients if and when changes occur. ‘BuenosTours’ signifies BuenosTours. ‘You’ or ‘participant’ signifies the person in whose name the booking is made and also includes any person or persons on whose behalf the booking is made. ‘Force Majeure’ shall mean any event outside BuenosTours’ control, including but not limited to war and civil unrest, which prevents the prompt performance of its obligations. “Half Day” Private Walking Tours with BuenosTours last between 3 – 4 hours. “Full Day” Private Walking Tours with BuenosTours last between 7 – 8 hours. Custom Private Walking Tours with BuenosTours last the approximate amount of time agreed with you at the time of booking. If an attraction/area is closed to the public or the tour experiences an unforeseen event (protest, road closures, etc. ), the tours may last more or less than the originally stated time. 3.1 Participant is fully responsible for having all necessary valid travel documents, travel insurance and medical insurance. Any non-compliance and any resulting damages are the sole responsibility of the participant. BuenosTours reserves the right to refuse a participant to join any of its tours if such participant fails to prove that he/she has the required travel documents and/or insurance to participate safely. 3.2 All BuenosTours private walking tours require walking. Any medical condition or medication being taken that may effect your health or participation must be notified to BuenosTours in writing (i.e. via email) prior to the tour. The prices stated on this website are the official charges; prices in any printed flyers, brochures, advertisements, or other materials, and on any other website besides this one, are for indication only. Prices are subject to change at any time. 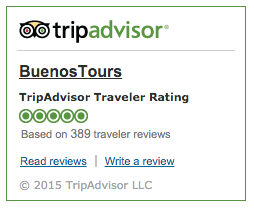 However BuenosTours will always honor the price stated at the time you make a booking. No discount can be combined with any other discount or special offer when booking with BuenosTours. All discounts and special offers are subject to availability and may be removed at any time at our sole discretion. 6.1 Due to the finite number of tour guides working with BuenosTours, tours are available to be booked on a first-come, first-serve basis. Therefore, no tour booking is guaranteed or finalized until both a participant has completed the booking and payment process, and a personal tour confirmation email has been issued to the participant by BuenosTours. Please note the difference between automated emails received when a booking is requested and/or paid for (which do not guarantee or finalize a tour booking), versus the personal tour confirmation email signed by an individual representative of BuenosTours. 6.2 Whichever payment option you choose, full payment must be paid before the start of a tour (in the case of having paid an online deposit with the rest payable in US Dollars cash on the day of the tour, the cash payment must be given to your tour guide before you begin the walking tour). The tour guides working with BuenosTours reserve the right to refuse a participant from starting a tour until full payment has been received. 6.3 To make a private walking tour booking request with BuenosTours, you must complete the relevant booking or payment form and continue through to the end of the payment process, until you reach the “thank you” page. All booking correspondences will be carried out via email. We accept no responsibility for incorrect email addresses provided by you or failed email delivery attempts. For special requests to be fully considered, they must be advised to BuenosTours in writing (i.e. via email) at the time of reserving the tour. We will try to consider any special requests made after that time, but cannot guarantee we will be able to respond to them. If a participant wants to make changes to a booked and paid tour (such as rescheduling, changing the type of tour booked etc) before his / her tour has started, the request must be made to BuenosTours in writing (i.e. via email). Any rescheduling will depend on tour guide availability. 9.1 If a participant wishes to cancel a private walking tour booking, the request must be made to BuenosTours in writing (i.e. via email). The date of cancellation will be the date that BuenosTours receives the written communication. 9.2 BuenosTours offers 100% refunds on private walking tours if the reservation is cancelled more than one week (7 full days) prior to the scheduled tour. If you cancel one of our private walking tours with less than one week’s notice, or do not show up for the tour (“no show”), you will be charged for 20% the stated value of the service (if you paid in full upfront, then 80% of that amount will be refunded to you). 9.3 Although very unlikely, in the case of extremely heavy rain or thunderstorms/flooding, BuenosTours private walking tours sometimes have to be curtailed, canceled or rearranged for another time / date. If you are unsure about this possibility on the scheduled day of the tour, you must call your tour guide (BuenosTours will provide the relevant tour guide contact number in your booking confirmation email) or failing that, the BuenosTours office on 5235 7020 (as dialed from an Argentine phone, from within the city of Buenos Aires), or +54 11 5235 7020 (if calling from an international/cell phone). If you have not heard from BuenosTours, and you do not meet your guide for the tour as agreed due to worries relating to the weather, with no notice having been given to BuenosTours, this will be taken as a “no show” (see 9.2). 9.4 In the unfortunate event of a heavy rain / storm cancellation (with no possibility for rearrangement) or curtailment by BuenosTours, you will be refunded for any private walking tour services not provided as scheduled (on a pro rata basis). 9.5 BuenosTours offers a 100% satisfaction guarantee for the private walking tour services it sells: if you let BuenosTours know that you were not completely satisfied with your private walking tour, you will receive your money back in full. To be eligible for this returns policy you must have already paid in full in advance of the the tour start, and you must make the request for the full refund in person to the guide that gives you the walking tour immediately after it has been completed, and confirm your reasons why to the guide. 9.6 All refunds, full or partial, will be returned by BuenosTours to you by the same method of payment you have already used (e.g. if you pay via PayPal or credit/debit card, BuenosTours will not be able to offer a cash refund). BuenosTours reserves the right to modify or cancel services/arrangements if unforeseen circumstances arise. If BuenosTours cancels or significantly changes the elements of a booked service due to force majeure, on or before the start date of such service, BuenosTours will inform the participant as soon as possible and will put its utmost effort to arrange alternatives that are of equal value. If force majeure occurs while the service is in progress, BuenosTours will try to make reasonable alternative arrangements as well. If alternative arrangements are not possible after unforeseen circumstances or force majeure lead to a tour cancellation / curtailment, BuenosTours will not be held accountable. 11.1 BuenosTours is responsible for making sure that all private walking tour services are supplied as described and that they all reach a reasonable standard. However, BuenosTours will not be liable for the failure or improper performance of these services where such failure or improper performance is attributable to a) the fault of the participant, b) the unforeseeable or unavoidable actions of an unconnected third party, c) unusual and unforeseeable circumstances beyond BuenosTours’ control, including force majeure. 11.2 All BuenosTours private walking tours are undertaken at the participant’s own risk. BuenosTours accepts no liability or obligation in the event of illness, injury, death or loss or damage to personal property. 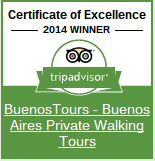 11.3 BuenosTours arranges the provision of private walking tours. Any other service booked through or organized by BuenosTours is wholly subject to the terms and conditions of the particular provider, and any questions relating to liability for services given by other providers should be dealt with in contact with the relevant provider. BuenosTours will provide contact details for such other providers at your request. This point is applicable not only to other separate services booked through BuenosTours (for example, a tango show), but also to any other services organized in conjunction with a private walking tour service (including, but not restricted to, taxi companies, other private transport companies, public transport companies, plus food & drink establishments). Participants are expected to behave respectfully to others, including but not limited to guides, other BuenosTours staff, and members of the public, and to the property of others, including but not limited to shared facilities and public environment. Also, participants are expected to obey the laws and adapt to the customs of the country they travel in. The Code of Conduct is outlined as such and serves as a guideline for all BuenosTours private walking tour participants to follow. BuenosTours reserves the right to stop a tour if participants violate the Code of Conduct. No refund will be given, and the participants must pay the full compensation for any damages that might have been caused. 13.1 All the personal information that is collected during the BuenosTours booking process will be used for BuenosTours administration and booking purposes only. BuenosTours does not rent, sell, or share personal information about you with other people or non-affiliated companies except to provide products or services you’ve requested. 13.2 BuenosTours (and any companies managed by / in coordination with BuenosTours) may occasionally send news, such as information on our current services and those offered by companies managed by / in coordination with BuenosTours, special events happening in Buenos Aires, special promotions etc, to your provided email address. You can always reply to unsubscribe at any time. 14.1 Photographs, pictures or videos appearing on this website should be used solely as an indication of the BuenosTours private walking tours and the attractions included. Actual attractions may vary. 14.2 If you agree to allow BuenosTours to photograph / film your tour, we then reserve the right to use any of such images for promotion and/or commercial purposes without further recourse or compensation. However, BuenosTours would never photograph / film your tour without seeking your prior permission. Any notes or other materials supplied to participants by BuenosTours, whether in hard-copy, electronic format or any other form, are the copyright of BuenosTours, without limitation, and are not to be reproduced in whole or in part, or distributed to any Third Party in any form whatsoever, without the express written permission of the copyright holder. All information provided on this website was correct at the time of publishing, to the best of our knowledge, errors, omissions and exceptions not withstanding. We do not assume responsibility or any liability for any participant’s own misunderstanding or misinterpretation of any information provided on this website.